Eight fierce dragons are threatening to take control of Hyrule, and have kidnapped Princess Zelda. 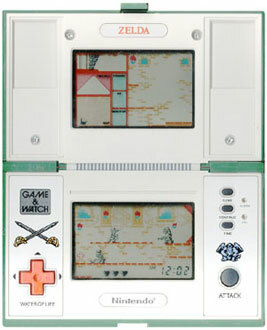 Link must travel through the dungeons, fighting enemies and taking out each dragon. Pass through the dungeon, using your shield to defend from ghosts and moving quickly to avoid the Stalfos' swords from the chamber below. Defeat the Moblin to make a staircase appear. After	you	have passed a certain number of chambers, a Dragon appears, attacking with fire and its tail. Defeat it for a fragment of the Triforce. You can also collect items to help you, such as the Map, the Water of Life and the Tomahawk. If you receive a Game Over, you can restart from where you left off using the Continue function, however your score will be reset.